Linear’s ACT-31B offers a cost effective means of incorporating the security and convenience of block coded transmitters into nearly any access control application. This model is sequentially precoded at the factory with unique ID codes, as well as facility codes. This coding combination represents the same level of security as a traditional Wiegand card. 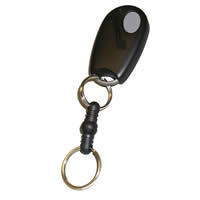 The ACT-31B transmitter is small enough to be carried on a key ring in a pocket or purse. The ACT-31B is a single-channel model used where only one remote control function is needed, such as an entrance gate that utilizes a free exit loop. Factory block coded to one of 15 facility codes. Single-channel.